In 1978, instructor Tony Walters of Linn Benton Community College approached Dr. Jim Trappe, an expert in truffle research, and asked him to deliver a presentation about truffles to students enrolled in his mushroom identification course. After Dr. Trappe’s very well-received class presentation, Tony approached him a second time, this time to ask whether Jim would be willing to help organize a group dedicated to science and education about truffles in North America. And so, the North American Truffle Society (NATS) was established, dedicated to enhancing the knowledge of truffles and truffle-like fungi and open to people from all walks of life. Jim has authored or co-authored 402 new species names of fungi (mainly truffles), along with 40 genera, two families, and one order of fungi. His book Trees, Truffles, and Beasts (Maser, Claridge, and Trappe, 2008) describes the complexities of forests, fungi, and animal interactions in a very readable format. He is also a co-author of the Field Guide to North American Truffles: Hunting, Identifying, and Enjoying the World's Most Prized Fungi (Matt Trappe, Frank Evans, and Jim Trappe, 2013) making truffle identification possible for amateurs. Jim’s teachings and encouragement were meaningful to another long-time NATS member who, upon retirement from the Oregon Department of Fish and Wildlife, participated in NATS forays and meetings. He also assisted with the preparation of specimens for the OSU fungal herbarium for many years. His experience with Jim made him feel fulfilled and appreciated in retirement. Another long-time NATS member volunteered her time to help catalogue truffle specimens for the herbarium, even as she continued working as an office manager for an engineering firm. She and an older NATS member (a retired nurse), have prepared specimens weekly at the USDA Forest Service, Forestry Sciences Lab. Both now retired, they continue to volunteer, even after the elder turned 90 years old! NATS’s current president discovered the NATS organization not long after moving to our area. Jim's helpfulness and willingness to teach her truffle identification skills in the field or with the help of a microscope, led to her long involvement as vice president and now president. She found Jim’s encouraging demeanor an inspiration to continue learning about both truffles and mushrooms. When a young man named Todd Elliott contacted Jim about a truffle he had found, Jim ended up working with the then 12 year-old to publish his find. They have now traveled throughout Europe and Australia together, and Todd is soon starting a PhD program thanks largely to being inspired by Jim. Jim Trappe (center) gives an orientation to his BioBlitz 2016 team. Photo credit: Friends of Cascade-Siskiyou National Monument. In addition to presentations to NATS, Jim has supported many other amateur mushroom clubs with his interesting talks – including the Oregon Mycological Society, Cascade Mycological Society, Vancouver Mycological Society, Sonoma County Mycological Association, Los Angeles Mycological Society, and the Oregon Truffle Festival. He has participated in field trips for amateurs too numerous to list, but two excursions serve as examples: In 2002 Jim was the Chief Mycologist for the NAMA Annual Foray and in 2016 was a leader for the Fungi BioBlitz in the Cascade-Siskiyou National Monument (see photo) where about 90 citizen scientists participated and found over 120 mushroom and truffle species. These efforts focus on the west coast of North America, but he has also engaged in many similar activities throughout North America and in countries around the world. Dr. Trappe’s roots run deep. 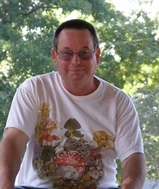 He serves as a connection between past and current generations of mycologists, professional and amateur alike. What makes Jim really special is his warmth and his desire for inclusion of anyone with an interest in mycological matters, no matter their experience or skill level. Dr. Andrus Voitk is recognized for the service he has rendered to amateur mycology in general and in specific for the huge amount of work that he has done to help the residents of the province of Newfoundland and Labrador understand and appreciate the diversity and distribution of their fungi. His infectious ideas and his ability to plan complex events and mobilize large teams of volunteers, to find funding year after year, and to entice professional mycologists from around the world to donate their time and expertise, have made Foray Newfoundland and Labrador known to mycologists and mushroom enthusiasts throughout North America. Andrus’ dedication to exploring, recording, reporting, and helping others learn about the natural history of Newfoundland and Labrador has been an inspiration to naturalists and biologists throughout this province. His generosity with his time and his knowledge laid the foundation for the annual mushroom foray in Newfoundland and Labrador, and directly inspired another foray in Nova Scotia and one that is starting up in New Brunswick. 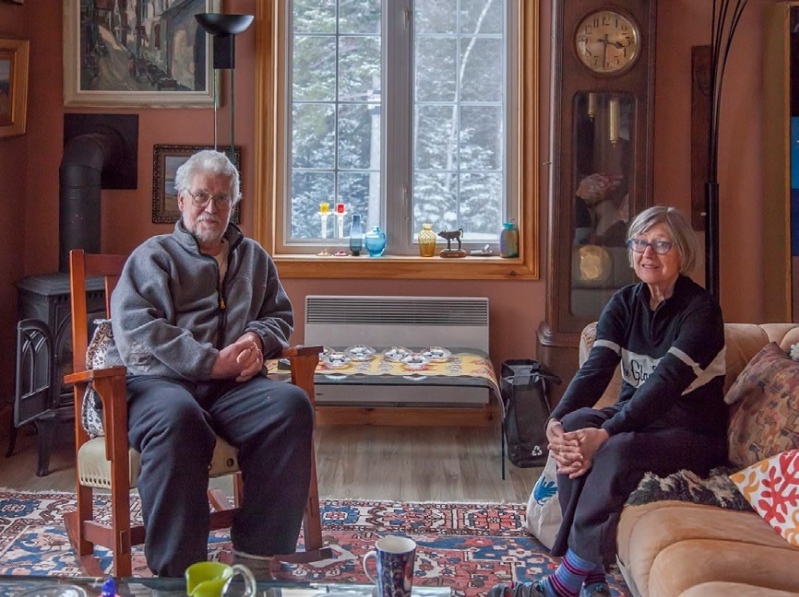 Along with its international roster of expert mycologists, Foray Newfoundland and Labrador has attracted visitors to this province from the U.S.A., Mexico, Estonia, Finland, Holland, Belgium, and from across Canada, with a contingent coming from Toronto most years. Thanks to Andrus’ clear vision of the event, the Foray is fun for all participants, and has become well known for its scientific rigor and its accessibility to experts who wish to use portions of the collected material. Andrus moved to this province as a surgeon, but retired in 2001. 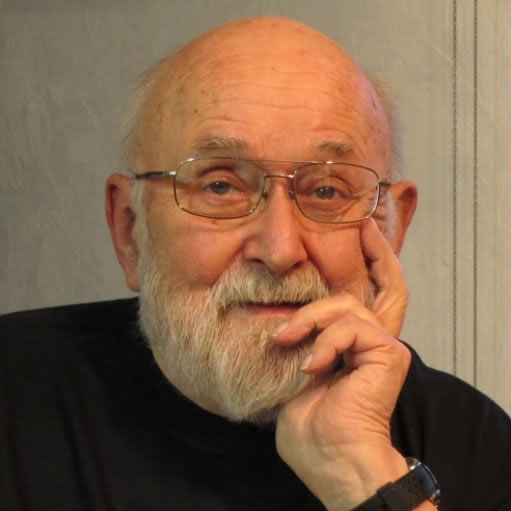 After retiring, Andrus became deeply involved in natural history (he was president of the Humber Natural History Society in Corner Brook for several years), became an excellent natural-history photographer, and by combining his knowledge, his photography, and his writing ability, he has become a one-man natural-history publishing phenomenon. Steve Trudell has shown boundless enthusiasm for engaging the public on various fungal topics through his work in Alaska on the Girdwood Fungus Fair, Cordova Fungus Festival and the Tongass Rainforest Festival. Year after year he has volunteered countless hours in travel and time spent leading forays, giving presentations and identifying and photographing our local fungi. Every year his foray group is always the last to return as he is willing to spend all day out in the woods with people yearning to learn more. From participating in these events, he has amassed a large collection of beautiful photographs of which he graciously contributed to the first ever Mushrooms of the National Forests in Alaska brochure, in addition to contributing to the text (publication March 2013). In addition to his work in Alaska, Steve has been presenting to groups across the country for decades, and has served as lead mycologist at numerous events. Steve is the lead author on Mushrooms of the Pacific Northwest and a contributing author to Tricholomas of North America (2013). He has written many book reviews for NAMA as Chair of the Literature Committee. Paul Stamets, once just another student at Evergreen State College, came under the influence and guidance of Dr. Michael Beug, and eventually became, as they say, a force of nature. No less than Dr. Alexander H. Smith was astonished by young Paul’s technique for photographing spores using the Electron Scanning Microscope. Paul’s early interest in magic mushrooms led him to produce an excellent taxonomic work on the psilocybin mushrooms of the world. 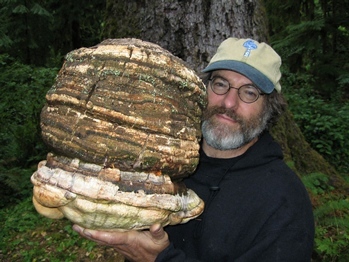 Paul expanded his interest in mushroom cultivation to include techniques for growing both gourmet and medicinal mushrooms. Dr. Don Hemmes was amazed at the quality of Paul’s workshops on mushroom cultivation. Working closely with Dr. Andrew Weil, Paul has pioneered the research and development of medicinal mushrooms in the US, and Paul’s influence at medicinal mushroom conferences here and abroad is truly international. With his six books on mushroom cultivation, use, and identification, and especially with his recent publication, “Mycelium Running,” Paul has reached out to a vast audience of people largely naïve about mushrooms, but eager to learn about using mushrooms in myco-remediation techniques, pioneered by Paul, to help clean up lands and waters polluted by oil spills; and there are ongoing projects today in the US and the Amazon that are informed by Paul’s methods. 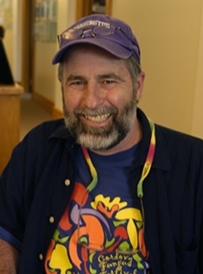 Not only has Paul contributed extraordinarily to the advancement of amateur mycology, but he serves as a potent role model for amateur mycologists that we, too, can achieve well beyond our imagined potential in the exciting fields of mushroom taxonomy, cultivation, medicinal mushrooms, and myco-remediation. In addition, there is a long list of Paul’s help to mushroom clubs, including NAMA, and we are deeply grateful that so accomplished an amateur mycologist, so prominently recognized now in circles few of us travel in, and has maintained a close mycelial network with NAMA and with the North American mycological community at large. Paul has discovered and coauthored four new species of mushrooms, and pioneered countless techniques in the field of edible and medicinal mushroom cultivation. 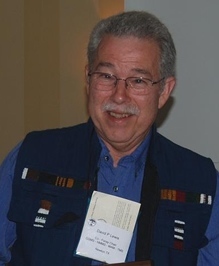 He received the 1998 "Bioneers Award" from The Collective Heritage Institute, and the 1999 "Founder of a New Northwest Award" from the Pacific Rim Association of Resource Conservation and Development Councils. In 2008, Paul received the National Geographic Adventure Magazine's Green-Novator and the Argosy Foundation's E-chievement Awards. He was also named one of Utne Reader's "50 Visionaries Who Are Changing Your World" in their November–December 2008 issue. In February 2010, Paul received the President's Award from the Society for Ecological Restoration: Northwest Chapter, in recognition of his contributions to Ecological Restoration. In June 2012, Paul received an honorary Doctor of Science degree from The National College of Natural Medicine, in Portland, Oregon. 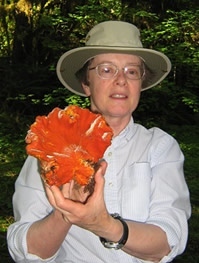 Dr. Cathy Cripps has benefited NAMA, local and regional mycology clubs, and the general public through her service, research and teaching, exemplifying the spirit of previous professional mycologist recipients of this award such as Drs. Alexander H. Smith, Harry D. Thiers, and her own mentor Orson K. Miller Jr. She has been a dedicated supporter of NAMA and local and regional mycology clubs as a foray mycologist, lecturer, and advisor, including service to NAMA as the chief mycologist for several of its annual forays. She is the scientific consultant for the Southwest Montana Mycological Association, and is a member of the editorial review board of FUNGI magazine. One of only a handful of professional mushroom taxonomic specialists in the intermountain west, Cathy serves the people of Montana through identifying mushrooms for the Montana State University Extension program and the numerous local people who bring mushrooms to her laboratory for identification assistance, and by serving as a consultant on regional mushroom poisoning cases. She is frequently sought by media outlets, and does a great service to mycology and to the public by providing one of the only local sources of knowledgeable and accurate information about mushrooms in this region. Cathy’s academic research has important applications for both amateur mycology and for the well-being of people and ecosystems. 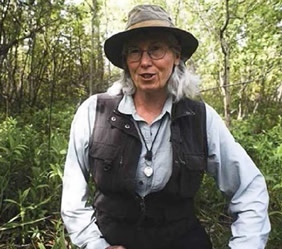 She is a highly regarded expert on arctic-alpine, montane snowbank, and aspen-associated fungi, and her research has relevance for land use planning, reclamation, and fire management. Her research on Rocky Mountain alpine fungi is the most comprehensive study of fungal diversity in this ecosystem, and provides an important baseline for assessing the effects of climate change on fungi in high-elevation habitats in North America. Her research partnership on improving commercial shiitake cultivation with Garden City Fungi, a Montana-based grower of specialty mushrooms, was lauded by the Montana Department of Commerce as a commercialization success, showing how scientists can pair with farmers to support the vitality of the state’s agricultural economy. Few people are as passionate about their work as Cathy, or are as enthusiastic about sharing their knowledge and talents with others. She has a deep respect for the fundamental work and rich history of mycology, not only the newest techniques. She is a consummate mentor and teacher who has shared her passion for fungi through summer field courses and less formal identification workshops in addition to her formal academic mycology courses at Montana State University. 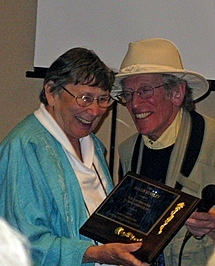 The 2011 NAMA Award for Contributions to Amateur Mycology is presented to Jay Justice. Jay has devoted himself to enriching mycological understanding, both as a taxonomist and administrator. As president and prime mover of the Arkansas Mycological Society, he has instigated many fungal activities in his region. He has worked tirelessly to support mycological societies throughout the country and willingly serves as a taxonomist at numerous club forays. He often leads workshops and gives presentations for local clubs, wherever they are. Among his special interests are the genera of southern Boletus and Amanita and his grasp of these groups has contributed to a better understanding of their fruitings and geographical areas. As a mycological booster, Jay as served as both a club trustee to NAMA and a Regional Trustee for NAMA. He has also generously supported NAMA in many capacities, including those of being a member of the Toxicology Committee, Editor of the Mycophile, Chairman of the Foray Committee and Vice President. Jay’s enthusiasm for all things fungal and his graciousness in sharing his knowledge with any interested person makes him an ideal candidate for this award. 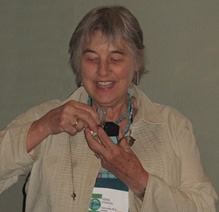 The 2010 NAMA Award for Contributions to Amateur Mycology is presented this year to Allein Stanley. Since the early 70’s Allein has been an essential part of the story of NAMA’s success over the years. Allein is a past President of NAMA but, perhaps, more importantly, she has helped guide NAMA through its annual business meetings and helped run several NAMA national forays and NAMA-sponsored regional forays. Allein has brought to every NAMA event a strong sense of continuity, going back to the early days when Harry and Elsie Knighton were Mr. & Mrs. NAMA. Allein helps keep us alert to our original mandate, to be an organization that reaches out to others here and abroad through our shared interest in the mushrooms of this world, the wonders beneath our feet. Nominations for the NAMA Award for Contributions to Amateur Mycology usually arrive with one or two letters in support of the official nomination letter. The voting, open to all former winners of the NAMA Award, usually results in a close contest, with two or more nominees garnering most of the votes. This year, the person receiving this Award had letters in support of his nomination coming in from a dozen people across the country. And, unlike any vote in recent memory, this person received a vote on every ballot cast by the former NAMA Award winners. For over 30 years this person has devoted his life to the study of fungi and to helping others in this pursuit. Years ago, in a conversation with Dr. Rolf Singer, one of the giants of 20th Century mycology, one letter writer reports that Dr. Singer referred to this year’s Award winner as "an up and coming amateur mycologist’ with whom he had been working at the Field Museum in Chicago." He went there to study the specimens in the herbarium. That was years ago. He has long since arrived. Now, he not only volunteers for every mycological activity he hears about, but he inspires others, the students he mentors, the mycological societies he works with, and the people in the nature preserves where collects and records all the fungi. Even after 30 years in the field, he is a tireless worker, an endlessly enthusiastic promoter of all things fungal, and one of the warmest, most generous, and least self-aggrandising individuals on the face of the Earth. His accomplishments are legendary, but to say any more would needlessly embarrass him. I think the esteem of his peers, as reflected in this Award, speaks volumes. In short, he is a giant among amateur mycologists. It is a great honor and privilege to award this year’s NAMA Award For Contributions to Amateur Mycology to David Lewis. This year’s winner of the NAMA Award for Contributions to Amateur Mycology is Dr. Nancy Smith Weber. She has had a career in mycology since she was knee high to a morel. She comes from a family of mycologists. She is the first NAMA Award winner to have had a parent win this award before her. Her contributions to amateur mycology include a fifteen page single spaced itemization of every foray she has led or participated in, every lecture and workshop she has given, every research project she has conducted, and every article and book she has written, so far, going back over more than 30 years of active duty in the trenches of amateur mycology.